Jogging and Lifting and Swimming—Oh My! How this Solo Mom started exercising again—and how you can, too! In the years before my son was born, I hit it hard at the gym. I was living in Manhattan, where appearances often count more than they should. It’s a city of lithe, well-put-together women, and I worked in an office of lithe, well-put-together women. I’d go to the gym at least two mornings before work, sometimes three, and at least one weekend day. My regular workout consisted of about 45 minutes on the elliptical trainer as a warm-up, then anywhere between three and seven miles on the treadmill, followed by a cooldown of stretching, planking, crunches, and push-ups. When my boss began offering personal-training sessions to us as an office perk, I dropped the morning workouts and picked up those sessions four to five days a week (in addition to the weekend workouts). Add in walking a minimum of two miles a day just getting to work and running errands and daily walks with the dogs through Central Park, and I was in the best shape of my life. I adopted my son as a Solo Mom by choice, so I can’t blame pregnancy for falling off the wagon. But when my son was born at 29 weeks, weighing just two pounds, eight ounces, we both settled in for his 73-day stay in the neonatal intensive care unit. I was 1,300 miles away from home. I tried to keep working out in those first couple of weeks, pounding out my fear and worry on the hotel treadmill. But I couldn’t keep up. Daily runs turned into walks, walks turned into pacing. My clothes hung on me as I dropped five pounds, then 10, then 15, then almost 20 from the stress. When my little boy was discharged from the hospital, we arrived back in Manhattan just in time for one of the worst winters I remember in all of my time there. We endured feet of snow, temperatures hovering around zero, and windchills even less than that. To grab a prescription from the pharmacy or a quick load of groceries meant bundling my preemie in layers of increasing thickness, stuffing him into the carrier, and wearing him under my down coat while I navigated the piles of ice and snow and slush to the corner stores. Forget trying to walk with him in the stroller, and the idea of the gym was laughable. As the winter thawed and the weather got warmer, we ventured out with the dogs and sauntered around Central Park. I went back to work and tried getting back into those sessions with the personal trainer, but I made it to only about three or four before I gave up. I was too tired and too stressed. I wanted to prove to my bosses and coworkers that I could do everything I did before. That being a single mom in the city wouldn’t change who I was at work. That I got this. I know better now, but when you are in the thick of it, you can’t see outside yourself. I never went back to the gym. I canceled my membership. When my son was a year old, we moved to New Orleans, land of beignets, daiquiris, jambalaya, and all the mouthwatering foods that pack on the pounds. And pack on the pounds I did—up to 25 at one point, then lost 10, and then went back up to 25. I gave up my favorite bikinis for sensible (and tummy-covering) tankinis. I have a toddler, I told everyone; tankinis are just easier. I had friends who joined the gym, and I always wanted to join with them, but it was always too expensive or time-consuming. This past Christmas (my son was three-and-a-half at the time), I looked in the mirror and once again felt that gnawing, all-too-familiar shame. Our new house had an in-ground pool and, dammit, I wanted to wear those old bikinis like a boss. I wanted my joints to hurt less. I wanted to just plain feel better. So I joined the gym and just dove right in. I put on my old workout clothes for that first visit. With those tank tops and spandex capris noticeably tighter, my muffin top was the main attraction, but I wore them anyway as motivation. I hit the elliptical first, but my warm-up lasted 10 minutes instead of 45. My resistance level was a two or three, rather than a six or eight. I then jumped on the treadmill, my old haunt that I used to spend hours on. I gave myself a small goal: run for a quarter mile, then walk a quarter mile, then run, then walk, and so on. Midway through that second quarter mile, my chest started to tighten and my knees started to complain. I kept going, knowing that muffin top was jiggling for the whole gym to see. I did a total of two miles that first day and ran one mile of it, broken into four parts. I felt good about myself for the first time in a long time. A few days later, I joined a friend at a group weightlifting class, first embarrassed that I was out of shape and clumsy, then proud of how strong I felt afterward. I took an aerobics class after that and a class to work out my core. I kept up on the treadmill. It’s been four months, and I feel awesome. My knees don’t hurt like they used to. I feel strong. I have so much more energy to play with my son. I try to go to the gym three times a week, but I don’t beat myself up if I only make it once or twice some weeks. I’ve started counting my calories using MyFitnessPal, and that, combined with my time at the gym, has helped me shed 15 pounds. We recently enjoyed our first swim of the season (thank YOU, New Orleans), and I dug a bikini out of the drawer. I stood in the mirror and poked at a bit of fat that still clung to my side and patted my (at least much smaller) muffin top. I still don’t have Michelle Obama arms (OK, fine—I never did), but they weren’t as flabby anymore! Maybe the old me, the Manhattan me, would have made a face and changed into the trusty tankini; but I worked hard for those 15 pounds, and I kept the bikini on. Going back to the gym or even just getting back into exercise doesn’t have to mean rearranging your life. We’ve all got things to do: work, kids, soccer practices, homework, laundry, cooking, bills, dogs, cats, family commitments, birthday parties . . . the list could go on and on. Shop around for deals. Many places will let you try out their facilities free for a week or so. You could try out each gym in town and maybe get a month of free workouts in! Ask about waiving the sign-in bonus or getting a month free to start. Start small. You will not morph into Jillian Michaels after one workout, or even after 20. Don’t overdo it. Set a reasonable goal, such as walking for one mile or running for a quarter mile. 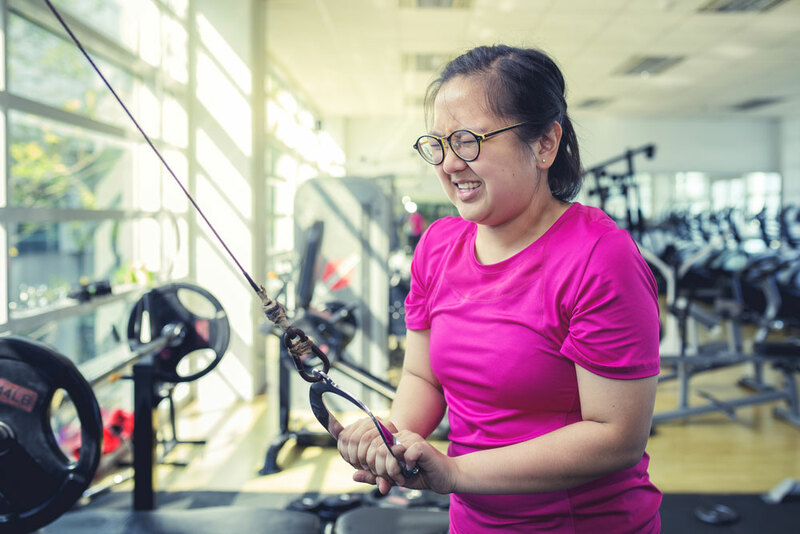 Many gyms will offer you one or two free sessions with a trainer—have this person show you how to use the equipment so you won’t feel intimidated. Stretch. If you’ve never done this before, google it or ask a trainer. It is the difference between being a good sore and doubled over in pain later. Take a class. You don’t have to know what you are doing to join in. I am severely uncoordinated, but I go. Most people aren’t paying attention to anyone but themselves and the trainer leading the class. But if you do look around, you will likely see people of all shapes and sizes, ages, and ability levels. Just find a spot in the back until you are more comfortable, and do your best. Do a YouTube yoga or Pilates workout. Get a workout plan from your doctor. Do water aerobics at a community pool. Think location, location, location. Find a gym that’s convenient, whether it’s close to your house, your kids’ school, your grocery store, etc. You are much more likely to go if you are already in the area. Plus, less time for commuting to the gym means more time working out. Try out a few schedules to find the best workout times. I tried going on weekends but found that I’d rather spend my days off with my son. I also tried evenings, but after he was in school all day, I felt bad putting him in the gym day care at night. In the end, I found the best time for me to work out was right after I dropped him off at school and before I started work. Serve leftovers. Betty Crocker I am not. And you don’t have to be, either. On days when you go to the gym, pull leftovers out of the fridge, or make breakfast for dinner. Whatever you have to do to get food on the table. Remember that a short workout is better than no workout. Even if you power walk for 15 minutes before a conference call, that’s better than not power walking at all. If you can grab only 20 crunches one day instead of a full workout, that’s better than nothing! Work out when your kid does. If your child does sports or takes music lessons or art classes, use that time to work out, whether it’s a quick trip to the gym or a jog around the area. Good luck, solo mamas—you got this!